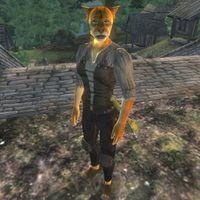 Tsramla is a Khajiit commoner residing in the village of Border Watch, where she lives in M'dirr's house. Like all the other town residents, Tsramla believes in the prophecy of town Shaman Ri'Bassa's great-great grandfather K'sharra, who foretold that Border Watch would experience three signs as a premonition of the end of the world. Until that happens, Tsramla lives peacefully, getting up every day at 4am and then wandering around town the whole day until bedtime at 10pm, with a two-hour lunch break at 11am at the Inn in the southwestern part of town. The only exception to her daily routine happens during the related quest, when she will run around around town in wild panic because the prophecy seems to have come true. She will continue to do so until the end of the quest. She is armed with a leveled and possibly enchanted blunt weapon and a random piece of leveled armor that she will equip during the last stages of the quest and for the rest of the game. Prior to that, she wears a pair of breeches, clogs, and a regular shirt with suspenders. In addition, she carries a small amount of gold, a selection of scripted spare clothing, and a number of randomly chosen garments. Tsramla doesn't speak much, but after you have talked to Sheogorath for the first time, she will point you towards Ri'Bassa for further explanation about the three signs. Esta página foi modificada pela última vez à(s) 04h02min de 13 de maio de 2013.